This is the most spectacular discovery of recent times. At the end of 2016, this pallasite meteorite was discovered in Kenya. Two brothers were looking for their camels near the village of Habaswein in Kenya when they came across a number of large stones. There were no other stones in the surrounding area and the brothers concluded that these should be meteorites. They spent a few weeks collecting everything and took it to their house in Habaswein. A village elder told how he played on the stones as a child. After investigation it turned out to be indeed a meteorite, and a special one too! 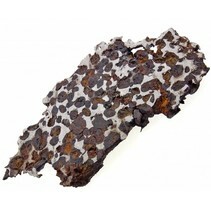 This pallasite was initially called Habaswein, after the neighbouring town. Ultimately, the meteorite was officially named Sericho, after the Keynesian area where the impact took place.